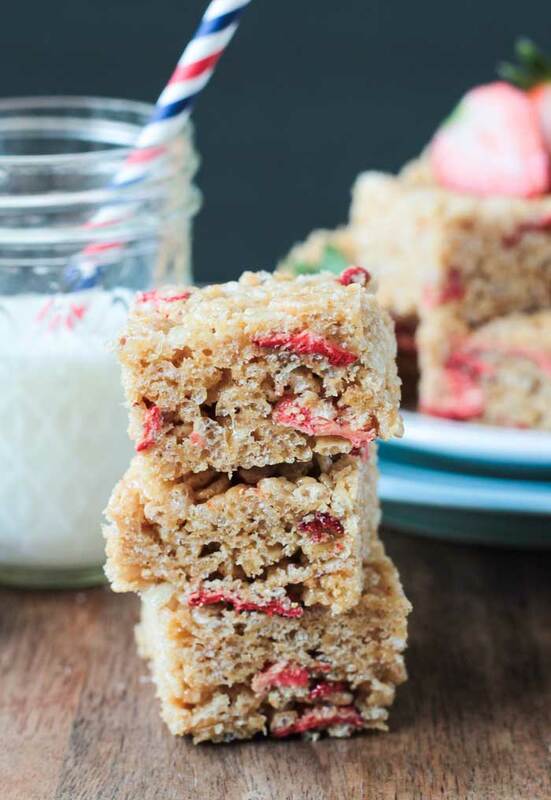 Brown Rice Crispy Treats w/ Strawberries – super easy, super tasty, and absolutely no marshmallows needed!! In my head, I always have these elaborate plans for super festive food and desserts for the 4th of July holiday. Everything red, white and blue, cut into star shapes, or designed into the shape of a flag. In reality though, I have neither the time nor the patience for such fare. Please tell me I’m not the only one who dreams of a Pinterest life, but lives a much simpler one. Don’t get me wrong – I’m a Pinterest addict, but some of the DIY holiday/party suggestions you’ll find there are a bit over the top. The good news for you is that means I have quick and easy ideas to share and they are always family approved. 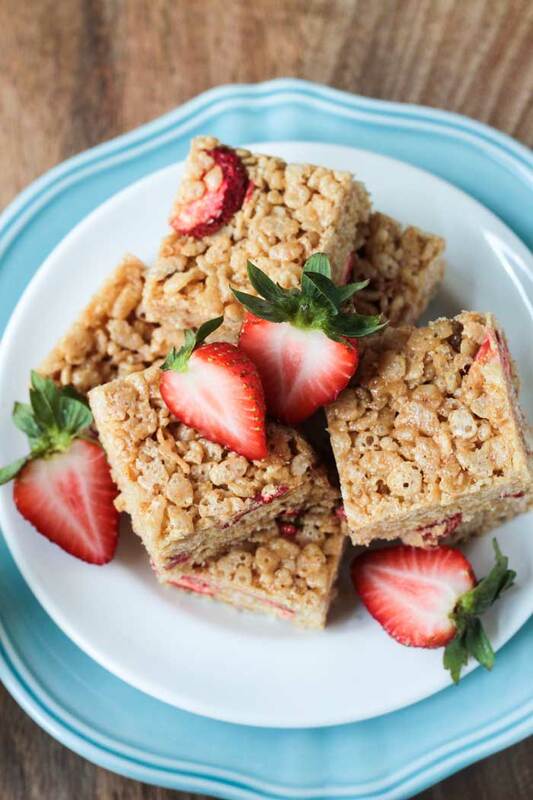 These Brown Rice Crispy Treats w/ Strawberries are just as easy and delicious as the ones you remember from your childhood, but healthier and more festive. I just got back from a 5 day vacation in Breckenridge, CO. My closest girlfriends and I are all turning 40 this year and we wanted a fabulous getaway to celebrate. It was everything I had hoped for and more. I absolutely fell in love with Colorado, specifically Breck. It was so casual, everyone was so friendly, there is so much to do, and I could stare at the scenery for the rest of my life. I truly felt at peace there. I’ve been trying to keep that zen-like feeling going here at home and that means getting back to easy recipes. Some of my favorite recipes on the blog, and also happen to be reader favorites, are simple, quick, and easy, like my Super Simple Burrito Bowl, Chickpea Salad, and Black Bean Salsa Burgers. These Brown Rice Crispy Treats are going to fall into that same quick and easy category, and you are going to love them too! 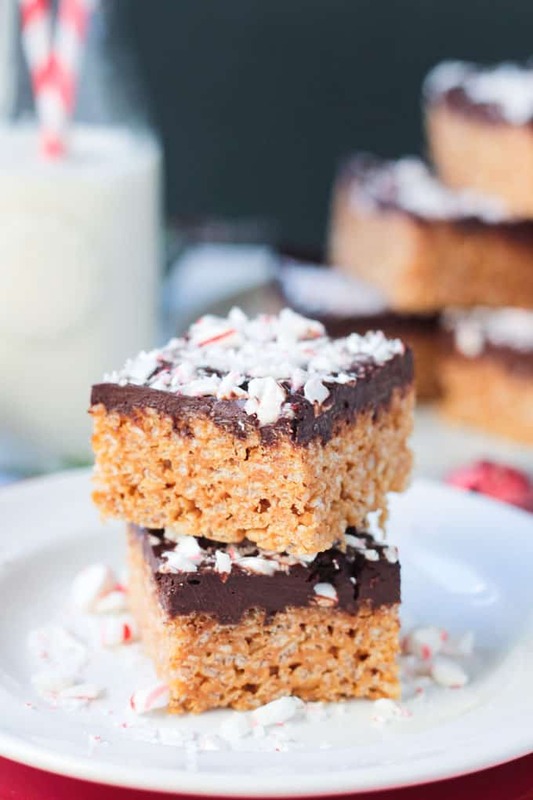 Just like in my Chocolate Peppermint Crunch Bars, I used a combination of brown rice syrup and cashew butter in place of marshmallows in these Brown Rice Crispy Treats. And I added some freeze dried strawberries for extra flavor and sweetness, which also happens to make them quite festive. 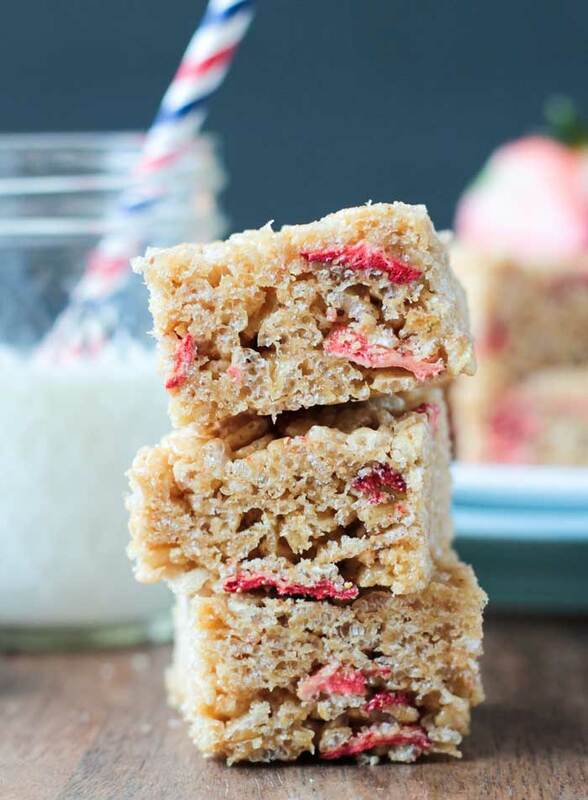 I hope you’ll try these delicious Brown Rice Crispy Treats w/ Strawberries. When you do, make sure to leave me feedback and a star rating below as I love hearing what you guys think. If you have a chance, snap a quick pic and tag me #veggieinspired and veggie_inspired on social media. Enjoy! 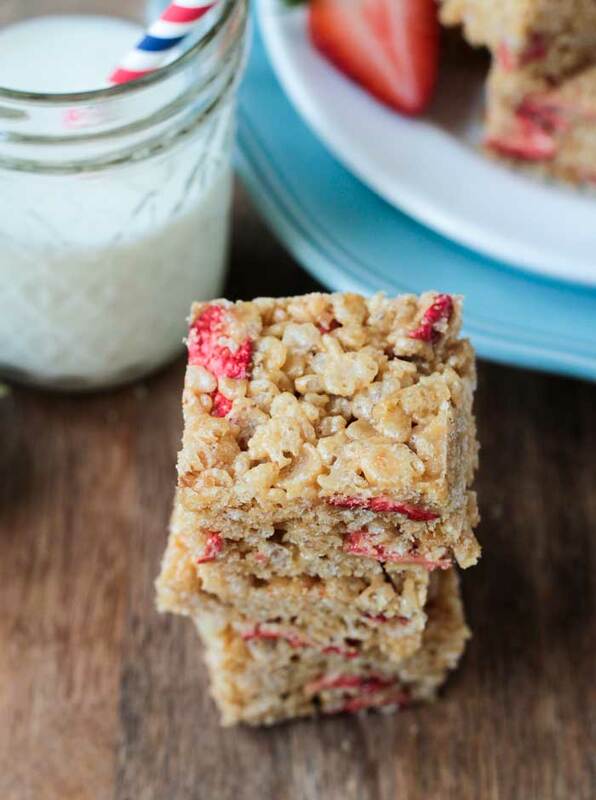 These Brown Rice Crispy Treats are super easy and just like those favorite treats from your childhood, but healthier and tastier with added strawberries. Line an 8x8 baking dish with parchment paper. It helps to spray a little cooking spray on the dish before placing the parchment paper to help it stay in place. Cut the paper long enough to hang over the sides and use these as handles later to easily pick up the whole block and take it out of the pan. Set aside. In a large mixing bowl, combine the brown rice cereal and freeze dried strawberries. Set aside. In a small pot on the stove, stir together the cashew butter, brown rice syrup and vanilla extract over low heat, stirring continuously, until pourable. This will only take a few minutes and the mixture will burn easily, so don't walk away! Pour the liquid mixture over the cereal and strawberries, while stirring. Work quickly as it will thicken up as it cools. Press the mixture evenly into the prepared baking dish. Placing another piece of parchment paper on top and pressing on that will help you to spread the mixture evenly. Let the Brown Rice Crispy Treats set in the pan for about an hour before taking them out to cut into squares. Check out more Healthy Sweet Treats recipes. Do you have a store or somewhere for us to buy freeze dried strawberries? Hi, Sandie. I buy mine usually at Trader Joe’s, but I’ve seen them in nearly every grocery store. Target and Walmart both carry them and even the dollar store. Look for them buy the nuts/seeds and dried fruit. These look fantastic! Would fresh strawberries work? I’m not sure. They might be too wet and make the cereal mushy. If you try it, let me know! Thanks, Sam! I love rice krispie treats! One of my favorite sweet treats. Brown rice syrup with nut butter is a great sub for marshmallows and definitely my go to when I don’t have my dandies!! Great add on with the berries! Thanks, Sophia! I’ve never done them with any other nut butter, but I’m thinking peanut butter ones would ROCK! Honestly, the perfect snack!! I will have to try these. Love that they are made with cashew butter! I go through far too much cashew butter – such good stuff! Thanks, Ceara! Thanks, Nicole! Dried fruit sounds great too! I love that you’ve made these tasty treats without marshmallows! And the addition of the freeze dried strawberries is perfect! Can’t wait to try these! Thank you, Taylor! I hope you love them! Awesome recipe makeover! So creative and so many wonderful ingredients! Yummy! Ooh, I love that you use cashew butter in these! I’ve been addicted to using freeze-dried fruit lately, too, and have some extra strawberries to use up. This recipe is perfect. Oh my gosh me too! They are so sweet and with that crunch – addictive! Thanks, Alisa! I lovvvve that you don’t use marshmallows. SO creative! Pinning for later! Not tot mention, vegan marshmallows aren’t cheap. I hope you guys love these! Thanks, Mel! I’ve always loved rice krispy treats, but they are so full of sugar that they do nothing for me! I love that these are made a heck of a lot healthier and contain strawberries! YUM! I don’t like how buttery/greasy the traditional ones are. Thanks, Bethany! 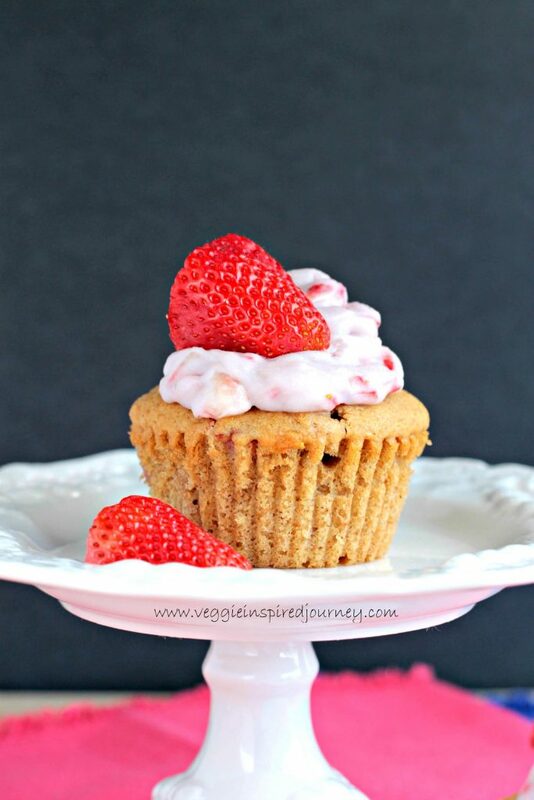 Browned butter rice krispies are my all time FAVE, but I’ve never thought to add those gorgeous strawberries!! These look amazing! Thank you, Karly! I love the red pop of color from the strawberries. YES YES YES!! I made rice crispy treats marshmallow free last week too, and they were so great. Kind of like bringing out your inner kid again! These ones look awesome! Thank you, Laura! Totally a recipe to make you feel like a kid again! Oh, my gosh. I love Breckenridge so much. I could happily go there every summer. It’s such a beautiful place with so much to see and do. That sounds like the perfect place to celebrate with your girlfriends. 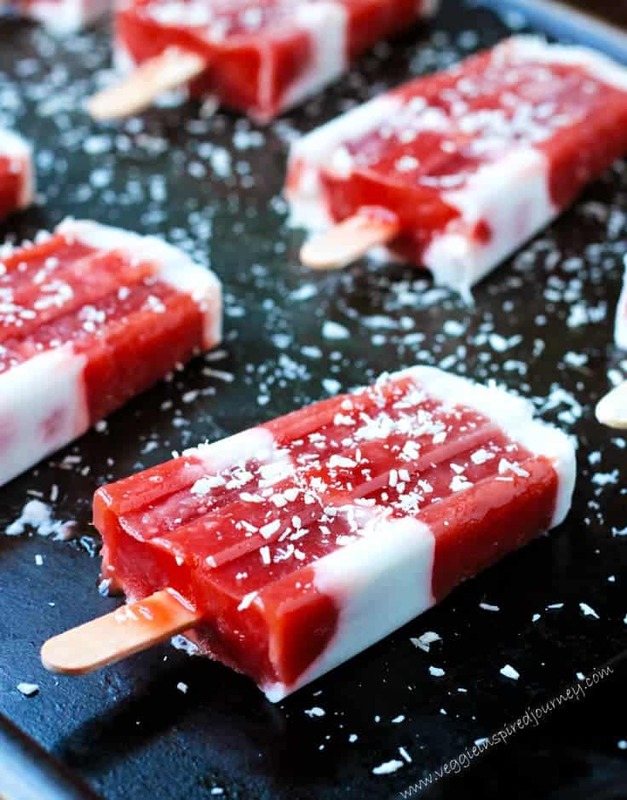 What a fun idea to add freeze dried strawberries to your rice crispy treats. I bet they add just the right hit of sweetness. What can I use in place of the cashew butter? We have a neighbor boy who comes over alot but is allergic to tree nuts. Hi, Jennifer. You can use sunflower seed butter. It will taste slightly different, but will still be delicious! In love with these! They’re so pretty, sound delicious and are made with some of my favourite healthy ingredients! Sweets do tend to help with the zen!